IRVINE, Oct. 1, 2013 – The iconic Soul enters the 2014 model year with an all-new take on design, driving dynamics and desirable features that totally transform one of Kia Motors America’s best-selling cars into an urban utility vehicle that is as comfortable in the city as it is on the open highway. The signature Soul design is instantly recognizable yet thoroughly fresh, with more than a passing nod to the hot Track’ster concept that was unveiled last year. Riding on a new chassis that is stiffer, longer and wider, the all-new Soul has grown up without losing its edge, allowing for more passenger and cargo room while reducing NVH levels. A flatter torque curve and significant suspension upgrades make the 2014 Soul a nimble and agile companion in congested urban environments. Honoring Soul owners’ fierce individualism, three unique trim levels will be available when U.S. sales are expected to begin in the fourth quarter of this year: Base, Plus and Exclaim. The all-new Soul displays its own individuality through a blend of funky personality, fun-to-drive characteristics and premium upgrades intended to set it apart from the pack. 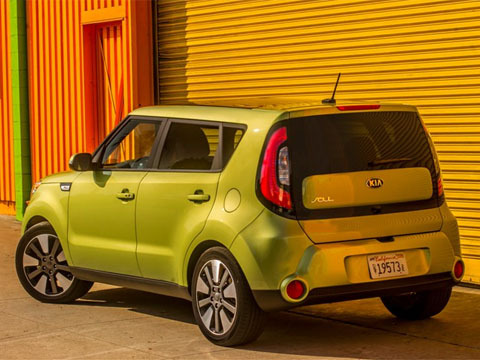 A playful color palette, including Soul-exclusive colors such as Solar Yellow, Kale Green, and Inferno Red, along with sporty new wheel designs, pump up the dynamic equation that has made Soul such a dominate competitor in the “boxy” car segment. Exterior Track’ster similarities are easy to spot. The large trapezoidal lower air intake is nearly a direct carryover from the concept, and the location of the available fog lights – down low and pushed to the leading edges – mirror those found on the Track’ster. Kia’s signature grille is present, but it’s been reworked to more closely resemble the concept. Adding a touch of flare, the unique “floating” body-color panel inset into the lift gate originated with the Track’ster as well. Subtle enhancements include a wider (by 2.4 inches over the previous Soul) opening for the lift gate, allowing Soul to swallow more stuff. Overall, the design team paid particular attention to instilling a more premium look and feel to the 2014 Soul’s interior. Liberal applications of soft-touch materials are found on the instrument panel, center console and door panels. Details such as available leather trimmed seating with improved lateral and thigh support, and the use of high-gloss piano-black trim pieces on the center console and dash elevate the Soul’s interior to new levels of sophistication. Front and center is the instrument cluster with deeply recessed gauges. Along the door panels, sculpted circles incorporate the power windows and door locks. The center console features a round gear shift knob and push-button start (its location exclusive to Soul in the Kia lineup), which also are direct carryovers from Track’ster. The front door-mounted speakers mirror the circular, high-mounted “floating” tweeters and utilize available LED-string light technology to create ripple-effect, red-hued mood lighting. The steering-wheel mounted controls are housed in Soul-exclusive circular groupings along the lower spokes with the buttons for the audio system and trip computer falling readily to the thumbs, enabling the driver’s hands to remain on the wheel at all times. 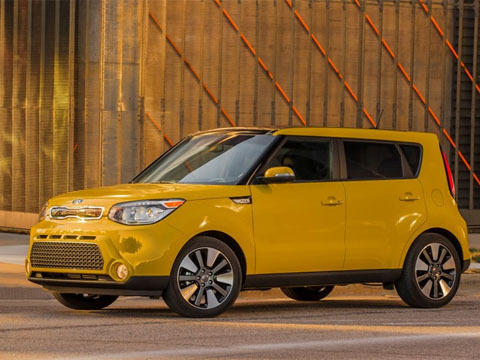 The Soul Plus takes a step up in standard amenities and available options. Attractive 17-inch alloy wheels shod with 215/55R-17 tires, outside mirror turn-signal indicators and unique fender garnish distinguish the Plus from the Base exterior. Inside, the Plus benefits include a floor console stowage box with integrated armrest, available UVO eServices, Rear Camera Display5 and rear seat center armrest. Options include navigation, an upgraded 350-watt Infinity® audio system6, string-LED front speaker surround mood lighting, fog lights, a panoramic sunroof – a Soul first – leather trimmed seating with segment-exclusive ventilated front driver and passenger seats, and seat heaters for all four outboard positions, a 10-way power adjustable driver’s seat, leather wrapped and heated steering wheel and a leather-wrapped gear shift knob. 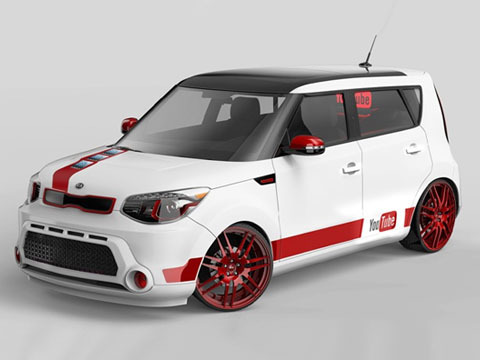 The Soul Exclaim adds to the Plus as standard features 18-inch alloy wheels wrapped in 235/45R-18 tires, fog lights, body-color bumper “tusks,” projector head lights, front LED positioning lights and rear LED “halo” lights. Inside, standard amenities include a high-gloss piano-black center console, cooled glove box, leather-wrapped steering wheel and gear shift knob, 10-way power-adjustable driver’s seat with lumbar adjustment and auto-dimming rearview mirror. Optional equipment includes navigation, Infinity audio, front speaker LED mood lighting, panoramic sunroof, leather trimmed seating with driver and front passenger ventilation and heating for all four outboard positions. Supervision Cluster/TFT LCD screen, HID head lights, push button start and automatic climate control make the Exclaim the most premium Soul ever. Significant attention has been focused on improving the all-new Soul’s ride and handling through heavily revised front and rear suspension setups. The front subframe utilizes four bushings (none are used on the previous Soul) to reduce ride harshness and impact booms over rough pavement. The stabilizer bar has moved rearward on the McPherson strut front suspension, while the steering box has moved forward, lending better balance and subsequently improved handling. Relocating the steering box has also resulted in a better on-center feel. The new one-piece steering gear housing is stronger than the two-piece unit used on the outgoing Soul, improving steering response and reducing impacts felt through the wheel. Standard across the Soul line is a new Flex Steer™ system, which allows the driver to select from three distinct steering settings: Comfort, Normal and Sport. The shock absorbers on the torsion bar rear suspension have been turned vertically – they were positioned at an angle on the previous Soul – and lengthened. This arrangement allows for more suspension travel, improving ride comfort. 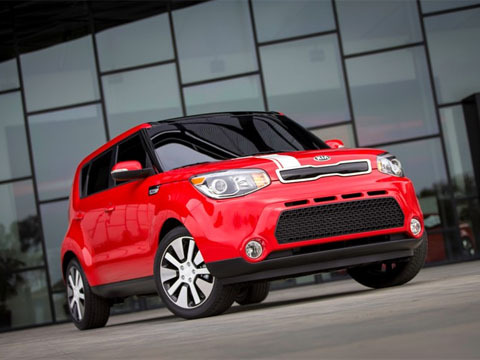 The all-new 2014 Soul is totally transformed.